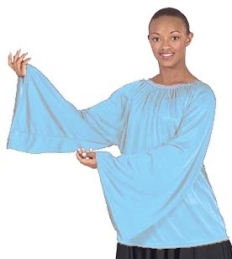 Eurotard 13730 a pull-over blouse with full "angel sleeves." The Blouse has gathered neckline with tapered arms. An essential top for Praise / Liturgical / Worship / Mime / Spiritual Dance wardrobe. Shown with Eurotard Lyrical Skirt (EU 13674), sold separately. © DanceFashionsSuperstore.com 2018. All Rights Reserved. Your shopping cart is currently empty. Click on "Continue Shopping;" browse for items by Manufacturer, Category, or Department; or use the Search box on the top left of the page to add to your shopping cart. Your wish list is currently empty. Click on "Continue Shopping;" browse for items by Manufacturer, Category, or Department; or use the Search box on the top left of the page to add to your wish list.